On January 5, I submitted, along with Jessica Roberts, Associate Professor of Law and Director, Health Law & Policy Institute at the University of Houston Law Center, comments on the Notice of Proposed Rule Making (NPRM) for revisions to the Common Rule (45 CFR 46), the regulations that govern the majority of human subjects research in the United States. These revisions will be the first since the Common Rule was promulgated in 1991. Our letter to Jerry Menikoff, the Director of the Office for Human Research Protections (OHRP), focused on three primary deficiencies in the proposed revisions. We therefore encouraged the Department of Health and Human Services (HHS) to: (1) encourage Congress to provide a statutory private right of action for the Common Rule; (2) clarify whether research subjects have a potential commercial interest in the research done on their biospecimens; and (3) eliminate the distinction between biospecimens and personal information and data. The letter is available here. 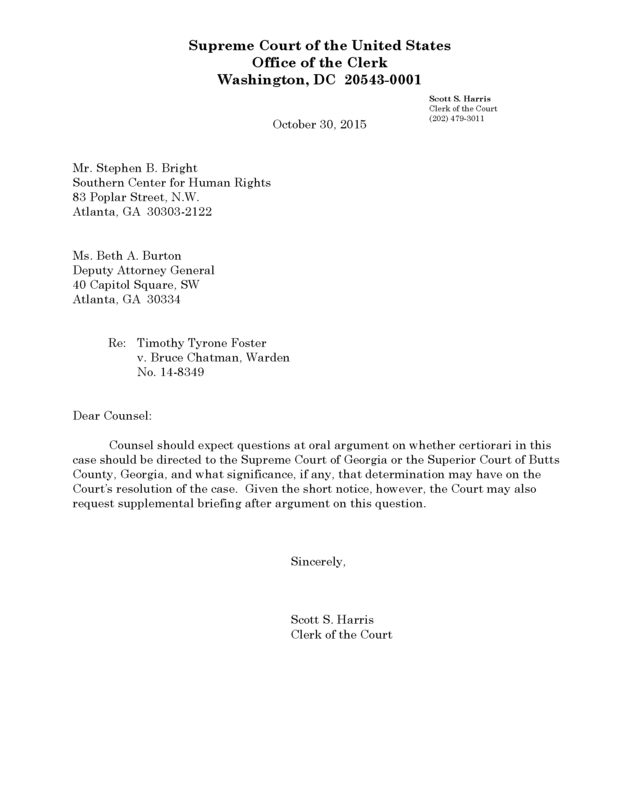 Our letter was also featured on the blog for the Yale Journal of Law and Technology (YJOLT). This past year has seen numerous members of Chicago-Kent’s faculty accept awards, publish articles, and push boundaries. As 2015 draws to a close, here are several Faculty Blog posts that highlight the outstanding scholarship at IIT Chicago-Kent. 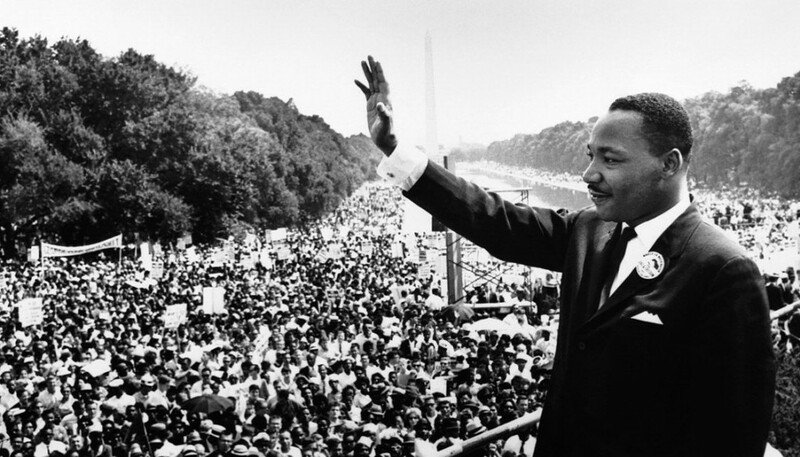 Professor Christopher Schmidt unpacked MLK, Jr.’s commentaries on the relationship between law and justice. As an advisor for an amicus brief in Elonis v. United States, Professor Heyman’s commentary on the case is worth reading in light of investigations into the Facebook habits of the San Bernardino shooters. Professor César F. Rosado Marzán’s commentary on the NLRB’s union policies was both timely and relevant. 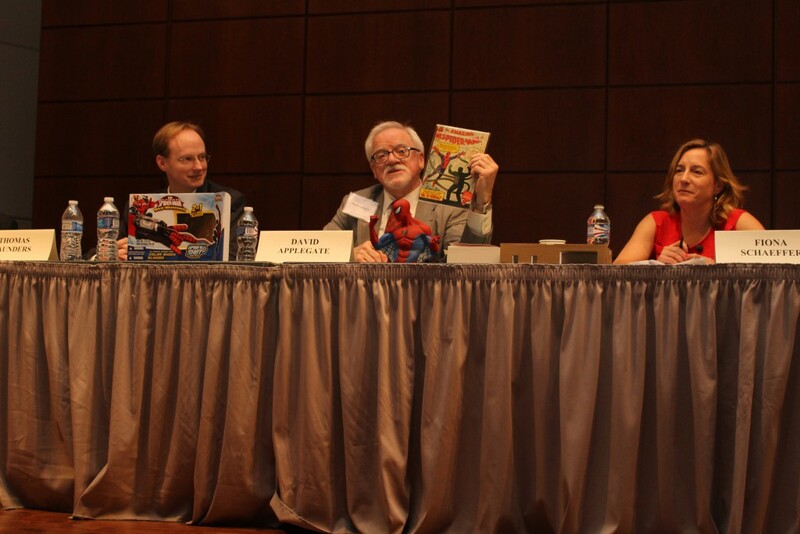 In September, Chicago-Kent hosted the sixth annual Supreme Court IP Review Conference, which brought together scholars and law practitioners of all kinds. An October Faculty Blog post showcased photos and recordings of the Conference, which featured the Honorable M. Margaret McKeown speaking on copyright and the First Amendment. 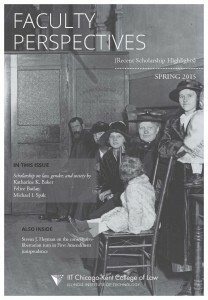 Two issues of Faculty Perspectives were released this year. The Spring 2015 issue focused on law, gender, and society, while the Fall 2015 issue featured boundary-pushing work. Read the Faculty Blog entry on the Spring 2015 issue here. 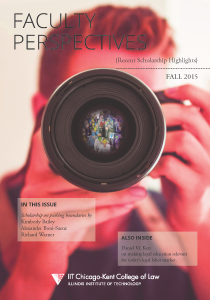 Read the Faculty Blog post on the Fall 2015 issue here. On Friday September 25, Chicago-Kent hosted the sixth annual SCIPR (Supreme Court IP Review) conference, an event that brings together intellectual property practitioners, academics, jurists and students to review IP cases from SCOTUS’s past term. Chicago-Kent’s Dean Harold J. Krent introduced the conference and gave the spotlight to Professor Edward Lee, who reflected on “the impact nine people can have on others” and the ways in which the Supreme Court could change the name “Alice” into something feared (referring to 2014’s Alice Corp. v. CLS Bank Int’l case on patent-eligible subject matter). “We’re trying to find this year’s Alice,” he said. Chicago-Kent professors Henry H. Perritt, Jr. and A. Dan Tarlock have been listed in ScholarRank’s Top 250 Authors. The list was compiled from HeinOnline’s extensive database and averaged citations and number of times accessed in the database’s records. 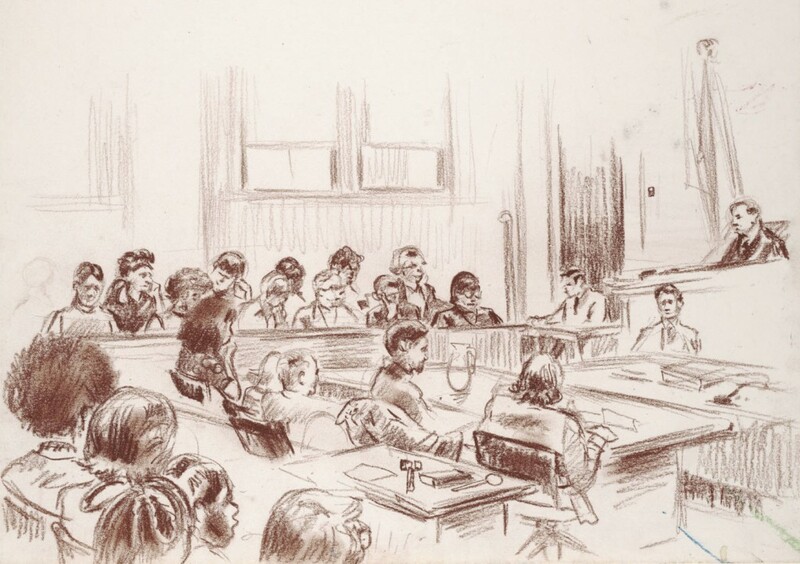 Professors Tarlock and Perritt are listed alongside legal luminaries both past and present. 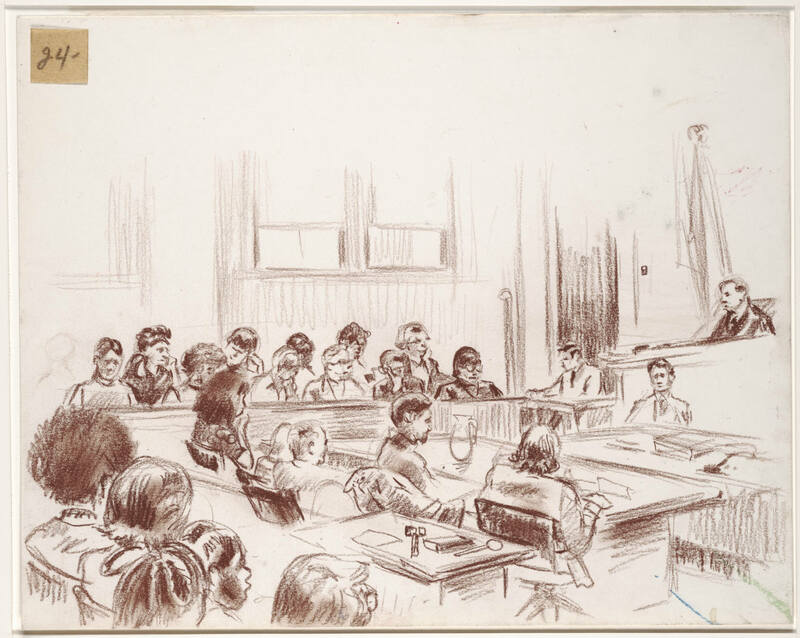 William S. Hein & Co., Inc. is the world’s largest distributor of legal periodicals. Their research and reference tools for law, international relations, political science, and foreign affairs are widely used both online and in over 3,200 locations worldwide. Professor Perritt is the author of over 75 law review articles as well as 17 books related to law and technology, international relations, and other fields. He served as Chicago-Kent’s dean from 1997-2002, and has has promoted change and refugee aid through “Project Bosnia” and other programs. 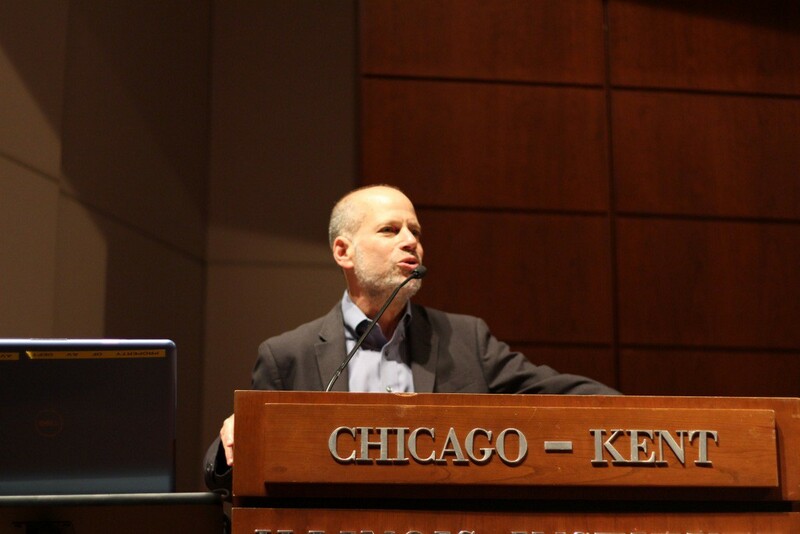 Professor Tarlock, a member of the Chicago-Kent faculty since 1981, is established as an expert in environmental law, the law of the land, and water use. He has published a treatise and co-authored four casebooks, and is a consultant to local, state, federal, and national agencies, as well as private groups and law firms. He is an elected member of the American Law Institute. Read more about Professor Perritt’s work here and Professor Tarlock’s work here. Crowdfunding began as a way for independent musical artists to raise a few thousand dollars to rent a recording studio and release a record. It evolved distinct “rewards” and “donative” models. Rewards crowdfunding promotes consumer projects ranging from the niche (a casebook about zombie law) to the ubiquitous (the Pebble smartwatch). 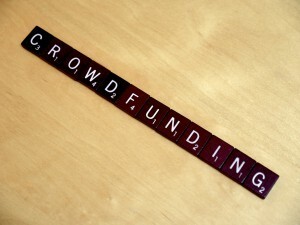 Donative crowdfunding promotes new charitable projects like micro-lending and cancer research. Public crowdfunding is a new model, where mature nonprofits are using portals to fund public goods by offering rewards and challenges. Public crowdfunding is different from traditional charity fundraising in at least three important ways. First, public crowdfunding is an open call to action on the Internet to all people, not a targeted charity campaign to visitors or former donors. Second, public crowdfunding uses gamification principles like challenges and rewards to attract backers in real time. Third, public crowdfunding highlights and advertises a specific public-good product, instead of promoting a non-profit generally. These three factors, harnessing the power of the Internet, make public crowdfunding a powerful new tool to democratize charities. Professor Oranburg is also interested in the confluence of crowdfunding and law practice. You can read the rest of his piece at GoodCrowd.